Pulses include beans, lentils and peas. They're a cheap, low-fat source of protein, fibre, vitamins and minerals, and count towards your recommended 5 daily portions of fruit and vegetables. 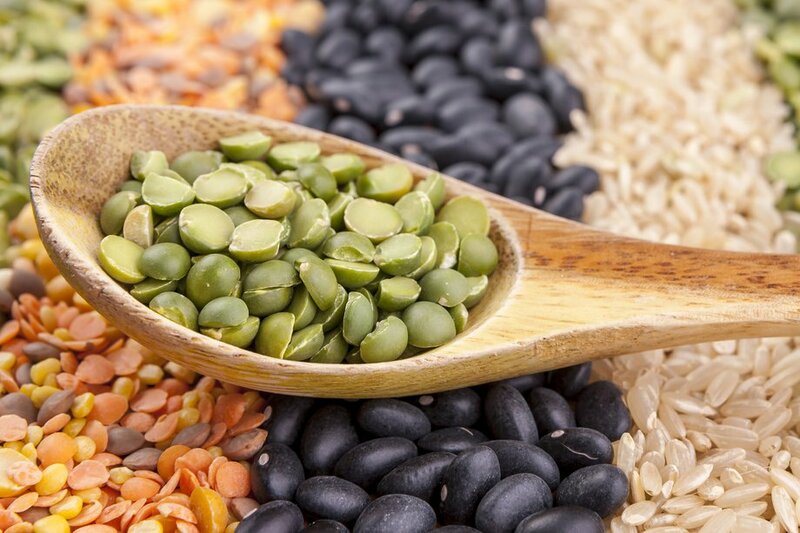 Pulses are a great source of protein. This means they can be particularly important for people who don't get protein by eating meat, fish or dairy products. But pulses can also be a healthy choice for meat-eaters. You can add pulses to soups, casseroles and meat sauces to add extra texture and flavour. This means you can use less meat, which makes the dish lower in fat and cheaper. Pulses are a good source of iron. Pulses are also a starchy food and add fibre to your meal. Eating a diet high in fibre is associated with a reduced risk of heart disease and type 2 diabetes. Pulses are often bought in tins. If you buy tinned pulses, check the label and try to choose ones that have no added salt or sugar. It's recommended we get at least 5 daily portions of a variety of fruit and vegetables, and pulses count towards your 5 A Day. One portion is 80g, which is equivalent to around 3 heaped tablespoons of cooked pulses. But if you eat more than 3 heaped tablespoons of beans and pulses in a day, this still only counts as 1 portion of your 5 A Day. This is because while pulses contain fibre, they don't give the same mixture of vitamins, minerals and other nutrients as fruit and vegetables. This excludes green beans, such as broad beans and runner beans, which are counted as a vegetable and not a bean or pulse for 5 A Day. Baked beans are renowned for their effect on the bowels. This is because beans contain undigestible carbohydrates. Soaking and rinsing dry beans before cooking, as well as rinsing canned beans in water, can help to reduce these hard to digest carbohydrates. You shouldn't let a bit of wind put you off eating pulses. People react differently to certain foods and may find that symptoms subside, especially if you increase your intake gradually. Typically, pulses are bought either tinned or dried. Tinned pulses have already been soaked and cooked, so you only need to heat them up or add them straight to salads if you're using them cold. Dried pulses need to be soaked and cooked before they can be eaten. Dried kidney beans and soya beans contain toxins, so it's important to ensure they have been cooked properly before you eat them. Cooking times vary depending on the type of pulse and how old they are, so follow a recipe or the instructions on the packet. Kidney beans contain a natural toxin called lectin. This can cause stomach aches and vomiting. The toxin is destroyed by proper cooking. Tinned kidney beans have already been cooked, so you can use them straight away. Soya beans contain a natural toxin called a trypsin inhibitor. This can stop you digesting food properly. The toxin is destroyed by proper cooking. Tinned soya beans have already been cooked, so you can use them straight away. As with all cooked foods, don't leave cooked pulses at room temperature for more than an hour or two because this allows bacteria to multiply. If you keep cooked pulses in the fridge, eat them within 2 days. It should be safe to keep pulses frozen for a long time, as long as they stay frozen. But keeping food frozen for too long can affect its taste and texture. Follow the freezer manufacturer's instructions on how long types of food can be kept frozen.